Local news anchors reading the same Sinclair "false news" promo. 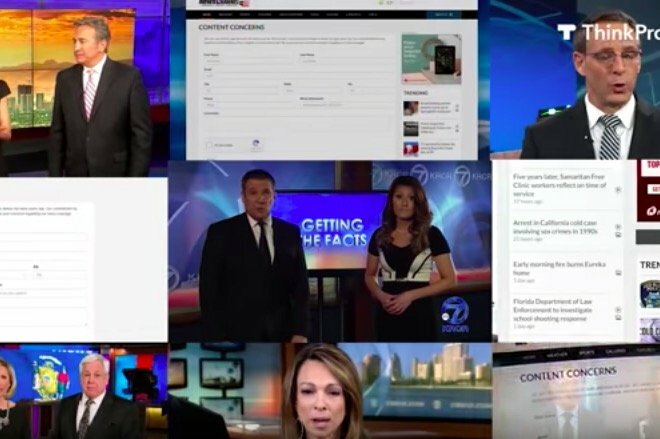 Numerous reports are detailing the promo script obligated of news anchors of stations owned by Sinclair Broadcast Group, the likes of which echoes President Donald Trump’s “fake news” rhetoric that he often applies to his own negative press. Earlier this month CNN reported that news anchors across the country were infuriated with the mandatory script that many felt was a thinly veiled piece of pro-Trump propaganda. If you’re unfamiliar with Sinclair Broadcast Group, it is one of the largest owners of local news TV stations across the country. Last year John Oliver gave a scathing overview of the politically-charged corporation meant to present unbiased news. Today it owns almost 200 U.S. television stations, affiliates of major networks such as ABC, CBS, NBC, Fox, and others. The promos are just the latest of conservative-leaning changes Sinclair has forced on local news networks. Other notable additions have been the mandated “Terrorism Alert Desk” about international security threats that may not always be suitable for a local news outlet. ThinkProgress transcribed the script from one of these promos. Did Kevin Bacon really say we're 'blessed' with Trump presidency? “Some media outlets publish these same fake stories… stories that just aren’t true, without checking facts first,” the transcript reads. Wikipedia has a list of all Sinclair's other stations. For the full effect, check out this video montage ThinkProgress pulled together of different broadcasts’ iteration of the mandated announcement.